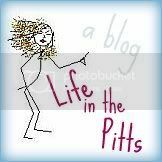 Life in the Pitts: Where the heck were you this weekend?? I have never, ever been to Disneyland. :( Sad, I know. Someday I will go and it will be AWESOME. This was your FIRST time?? This makes me incredibly sad. I left Disneyland in April with a giant bruise under my left big toenail. It's still growing out. 'giant blisters' or 'semi-deformed mickey ears for toes'? Your brother says gross. Why are we looking at that. I haven't been to Disney Land since I was 8 years old. However, I remember it vividly. I LOVED it! I've also been to Disney World and I LOVE it too! My cutie patootie husband took me there for our honeymoon! Good times!!! How in the world can it be The Happiest Place on Earth when you leave with blisters the size of Texas?! Obviously I've never been but, had you invited me, I would have gladly taken Kurt's place. Oh my that looks painful but I bet worth every limp! I haven't been since I was a kid and so want to take my family. Hopefully in the next few years when she's old enough to enjoy it and remember or maybe we'll leave her behind and be the kids. Nah, I'll take her. Hey, sometimes in life you have to suffer to enjoy yourself...yes, blisters now, but at least you had one hell of a time! OMG and damn! Those blisters look painful! My sister and I went to Disneyland in our early 20's, and I bled underneath my big toe nails. They literally turned black. We punish our feet there!!!! That was an awesome time! I'm so glad you were able to come. I can't believe we didn't go to the WOW convention.